After two years of mud and rain, Glastonbury 2008 bounced back with a weekend of fine weather and fabulous music, performance art and ever so much more. A little rain prior to the event saw the attending masses draw in a sharp, nervous breath, but all the smattering of rain did was keep down the dust as the Festival got underway. For the first time in many years, the tickets didn’t sell out immediately, but all was not lost – the fine weather brought about a flurry of purchases at the last minute and all places were taken by the time the Festival got going, meaning that the good causes Glastonbury supports were all guaranteed another large donation. 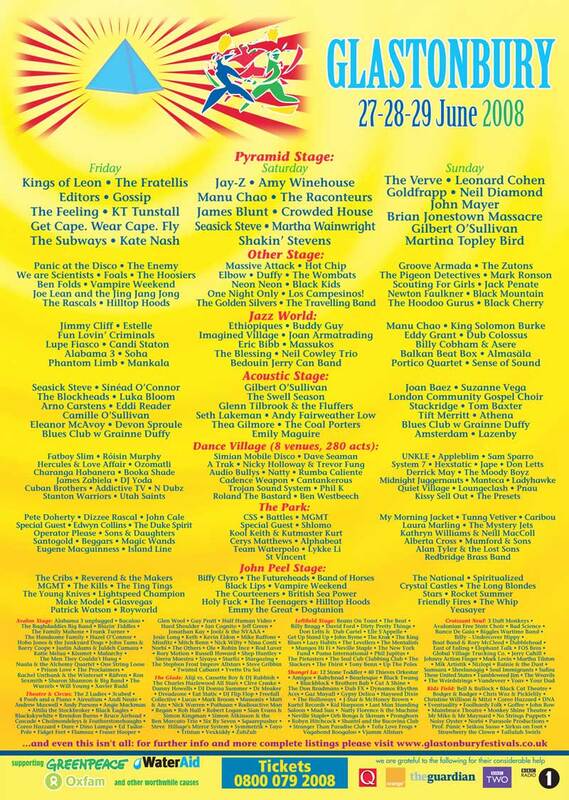 This was a year of pre-Festival hoo-ha about the inclusion of rap megastar Jay-Z as Saturday night’s headline act, the suggestion being that rap had no place at Glastonbury. 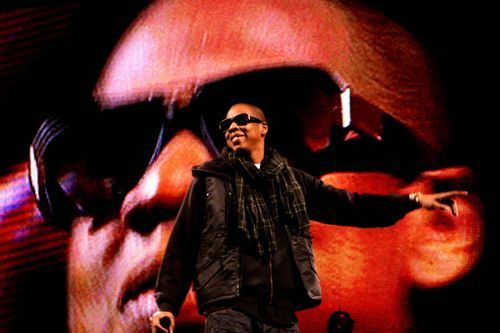 Jay-Z disproved this with enormous style and some wit, delivering a storming show that drew a vast and enthusiastic crowd. The Kings of Leon headlined on the Friday night and Sunday night’s electrifying Verve reunion sent shivers down the spine. Two Glastonbury stalwarts passed away prior to the Festival; Arabella Churchill, Theatre and Circus organiser, in late 2007 and Pat VT West, who organised the Poetry&Words tent, two weeks before the Festival. They will be much missed, but received the best tribute possible – their work was continued in fine style by the people they chose to replace them. 2008 was a year for electrifying sets by golden oldies interspersed amongst the wealth of new music; Solomon Burke, Joan Baez, Gilbert O’Sullivan, Jimmy Cliff, Joan Armatrading, and Neil Diamond all went down a storm, but Leonard Cohen stole the entire weekend in dapper style, leading the crowd in an astonishing chorus of ‘Hallelujah’, and performing a taut set of his greatest hits as the sun went down on the Festival’s final day. Attendance 134,000 Weekend Tickets, 37,500 passes(for crew, performers, stewards,traders etc,) and 6,000 Sunday Tickets. Tickets were £155 including programme.